Who wouldn’t want this tub in their bathroom? Not only does is look incredible, but imagine having 24 air and water hydro massage jets all over your body! The Ella’s Deluxe walk in tub could redefine going to the bathroom. 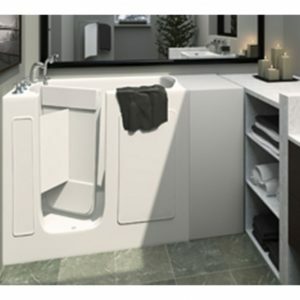 It’s becoming more and more common for seniors to want an accessible bathtub. If you are going to do it, why not do it right? This fully equipped senior bath has just about everything you could want in a walk in tub and more. Ella’s Bubbles is a top quality brand you can count on and comes with industry leading manufacturer warranties. What’s The Price Of Walk In Bathtubs? Several of our supply only walk in bathtubs have prices listed online. We can even provide an instant price quote for you over the phone on many of our products. Many people want to know the price of walk in bathtubs, however only a few companies will even quote a price without coming into your home. We understand not everyone needs an in home visit and some people just want to know the price. We strive for full transparency and will always go the extra mile to make sure you are fully satisfied with your new walk in bath or walk in shower stall. The Ella’s Bubbles Deluxe walk in tub is one of the more affordable walk in baths on the market today, yet you don’t need to sacrifice quality and can get all the accessories you could ask for. 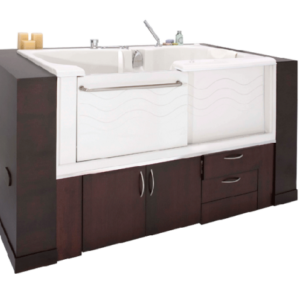 Or you can Check out the Ella Elite walk in tub here. You want a walk in tub, but would like to be able to take showers too! We completely understand and want you to have the best of both worlds. We carry a large selection of walk in tub and shower combo products for you to choose from. Most of our step tubs come with a hand held shower wand that can be attached to the wall to take a regular shower. In addition, customers have the option to have a shower head mounted to the wall. No matter the type of handicap bathing product you choose, our staff is committed to making sure you are fully satisfied with every aspect of your purchase. We offer a wide variety of affordable walk in bathtubs and handicapped shower systems designed for wheelchair accessibility. Having a low threshold that is manageable by the bather is essential. It’s also important to plan ahead a few years and take into consideration future mobility limitations. Having some foresight can potentially help save in remodeling expenses if you plan ahead. Not to mention make the bathtub area a little safer for you and your loved ones. That’s the kind of thing you just can’t put a price on.